The Skintact Clear Tape Aqua-Wet Liquid Gel Electrodes- item #CT50, item #ESCT50 feature Aqua-Wet gel adhesive for superior adhesion in EKG situations. 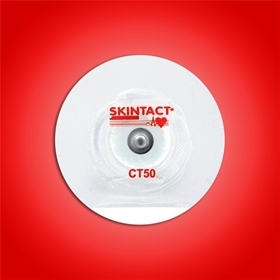 Skintact ESCT50 clear tape Aqua-wet gel electrodes are available in three different quantities from individual pouch (30), to box (1200) and case (4800). Latex & PVC free.